How to upgrade Sora's Keyblades in Kingdom Hearts 3. Also included are the effects of upgrading the weapons. You can upgrade your Keyblades using synthesis materials. These synthesis materials are obtained in treasure chests or by defeating enemies. 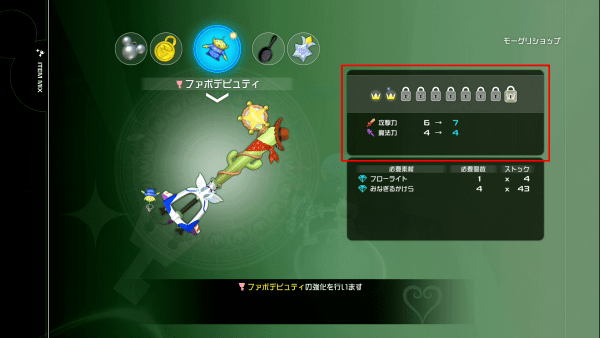 Upgrading a Keyblade increases its Strength and Magic powers while also granting new abilities. In order to strengthen your Keyblade, Sora needs rare synthesis materials like Flourite and Adamantite. Here is a list of all rare synthesis materials and how to get them. Added to the Shop by progressing through the story. Added to the Shop by finishing half of the story.